"We do not deny the fine work you do for our city's economy, but we will not let the free leaguers be dipossessed of their rights. They honour the memory of the conquerors who made it possible to open your business. They guaranty our neutrality in the raging war which surrounds us. Don't you believe that the fact that the free leaguers might, from time to time, step over the line of justice is that important as long as the pay for their crimes in gold?" - The Duke of Cadwallon, Defending the free leaguers before the Guilds council. 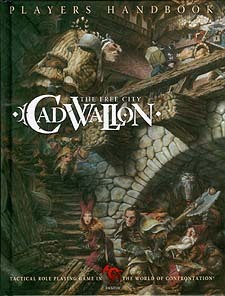 Come to Cadwallon. Become a free leaguer. Be worthy of the first defenders of the city. Explore the ancient ruins and uncover their secrets.